Radio case swivels and may be detached from included belt loop. Case is 1-3/4 in. deep x 2-7/8 in. wide x 4-3/4 in. tall. 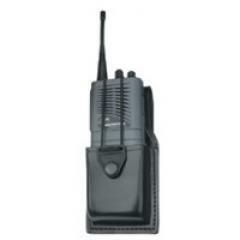 Elastic cord with VELCRO® closure adjusts to hold radios of various heights. Fits duty belts up to 2-1/4 in. Constructed of genuine leather.